Migraines are a severe form of a headache, usually accompanied by other symptoms. These are often related to vision although may also include other symptoms such as nausea, dizziness or pins and needles. A migraine is a severe headache. It can be classified as with or without ‘Aura’. Aura is one or more other symptoms which usually occur before a migraine really sets in. Those who suffer regularly with migraines learn to see this as a warning signal. 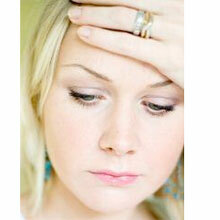 The ‘pre-headache’ stage which may demonstrate symptoms such as mood swings, tiredness, and loss of appetite. This may start a few hours or several days before a migraine appears. Many people experience an ‘aura’ just before a headache appears. It is often visual, for example flashing lights or floaters in the vision. Other signs such as nausea or dizziness may be present. Usually, this is a throbbing pain on one side of the head. Light sensitivity and a dislike of loud noises are common. Often the patient just wants to lie in a dark room. This may last anywhere from 4-72 hours. The symptoms will usually fade away. Sleep often helps. Feelings of tiredness or weakness after a headache has subsided. Migraines are thought to be caused by a change of the level of the hormone Serotonin. Low levels of Serotonin cause a constriction of the blood vessels in the brain which may cause the ‘aura’. They then expand again, causing a rush of blood to the brain and the resultant headache. Due to the connection with hormones, women often experience migraines, before, during or just after their monthly period. Many other factors have been identifying as ‘triggers’ for hormones. These include stress and emotional factors, tiredness, muscle tension, menopause, dehydration, hunger, caffeine, and alcohol. Certain medications are also linked with migraines. There is no cure for migraines, although many forms of treatment have been shown to either ease them when they arrive or reduce their frequency. Painkillers such as paracetamol can be used to ease a headache. If these are not effective, your Doctor may prescribe stronger painkillers. Some people find that anti-inflammatory medications are more effective. Anti-nausea medications are available if you suffer from feelings of sickness. Regular migraines or those which are becoming more frequent should also be investigated by your Doctor. Further tests such as blood tests or even CT or MRI scans may be requested to check for other conditions. For hormonal migraines, treatments such as oestrogen patches and contraceptive pills can be effective in balancing the hormones.